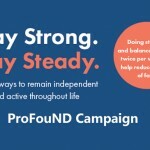 The ProFouND 2015 Stay Strong Stay Steady Campaign will focus on active healthy ageing through physical activity with an intergenerational theme – falls affect everyone – older and younger people working together to prevent falls! We have developed a series of resources to accompany the campaign theme and focussed on positive messages of physical activity to promote an independent and active life. The 2015 awareness raising campaign is comprised of a number of different components to help maximise the level of engagement across the ProFouND consortium, associate members, EIP AHA and EU level stakeholder groups. As such, we will be releasing a series of different campaign-related packs and resources over the coming months so you are able to select the most suitable activities to implement within your locality and region. The new campaign packs and resources build upon the ProFouND falls awareness campaign ideas pack 2014 which is available on the ProFouND website and offers a more generic guide on what falls campaigning is and how to deliver local events (http://profound.eu.com/profound-falls-awareness-campaign-ideas-pack-2014/). All 2015 packs and resources will be available to access and download via the ProFouND website (www.profound.eu.com). We will also email out copies and links at set times over the coming months to allow for local planning, translation and implementation. If you have any questions, please do not hesitate to contact Jane McDermott (ProFouND Administrator) or any member of the team at the University of Manchester.